W.A. Dwiggins attended The School of Illustration in Chicago from November 1899 until sometime in 1901. The school’s short existence, which lasted from September 1898 until July 1904, was tumultuous. In the early years it grew rapidly with its success most visibly marked by a mushrooming faculty which its founder Frank Holme (1868–1904), tongue in cheek, referred to as “Der Professorverein.” This article is a look at the faculty of The School of Illustration, its growth and its make-up. 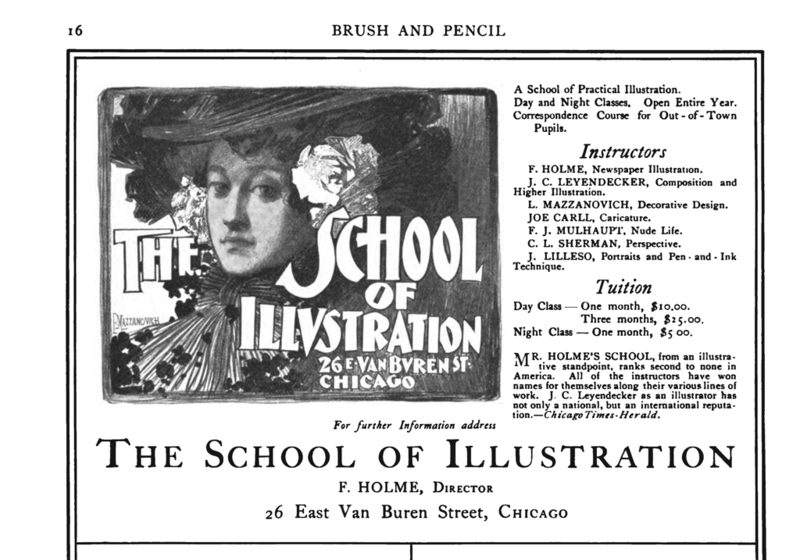 Advertisement for The School of Illustration in Brush and Pencil vol. 4, no. 4 (July 1899), p. 19. The illustrations are, from top to bottom, by J.C. Leyendecker, John Lilleso, and Joe Carll. Advertisement for The School of Illustration in Brush and Pencil vol. 5, no. 1 (October 1899), p. 16. The illustration by Lawrence Mazzanovich is taken from the cover of the first promotional brochure for the school. It was not until October that Holme was able to replace Mazzanovich and Sherman. Mazzanovich’s duties were split between F.W. Goudy (1865-1947) and Will Carqueville (1870–1946) with the former teaching Lettering and Ornament and the latter handling Commercial Decorative Design. F.X. Leyendecker (1876–1924), J.C. Leyendecker’s younger brother, was added at the same time as an instructor in Composition and Drawing. Two weeks Holme hired J.M. Gaspard (1862–1919) and E.N. Thayer (b. 1874) to teach Pen-and-Ink Portraiture and General Illustration respectively. In early November, W.J. Beauley (1874–1941) took over Sherman’s class in Perspective. Thus, at the time that Holme compiled his chronology of the first fourteen months of the school’s existence, the Professorverein had swelled to a dozen members. Der Professorverein as of November 11, 1899. Cartoon by Joe Carll from The Inland Printer vol. XXIV, no. 3 (December 1899), p. 439. The members of the Professorverein are, from left to right: Frank Holme, John Lilleso, Will Carqueville, J.C. Leyendecker, F.J. Mulhaupt, Edgar Cameron, Joe Carll, F.W. Goudy, F.X. Leyendecker, J.M. Gaspard, E.N. Thayer, and William Jean Beauley. Advertisement for The School of Illustration in Brush and Pencil vol. 5, no. 3 (December 1899), p. 24 showing the faculty as of November 3, 1899. The “second Saturday evening saturnalia” of “Der Professorverein” was held at the Monroe, Chicago, October 27. Though Saturn was not present in person, he was adequately represented by the host, Mr. Frank Holme, and his satellites, the fourteen professors of his school of illustration, each of whom in his illustrative sphere is a star of the first magnitude. Among the comets that as guests assembled with “Der Verein” around the flowing bowl, and who with gusto indicative of long practice imbibed the insidious cocktail, were George Ade, W. W. Denslow, C. F. Whitmarsh, R. C. McLean, Arnold Gerstelle, Joe Carll, C. L. Sherman, Dr. Elliott Carpenter, George Dyer, F. W. Cornwall, Chester A. Grover, George Wrightnour, O. B. Cooper and Herbert Wilson. “Der Verein” consists of Josh Ramsdell, Dr. Mortimer Frank, John T. McCutcheon, W. J. Beauley, J. C. Leyendecker, F. X. Leyendecker, F. J. Mulhaupt, Will Carqueville, F. W. Goudy, J. Lilleso, J. M. Gaspard, E. N. Thayer, Edgar Cameron and Frank Holme. (Fourteen, count them.) Though the artists of “Der Verein” are earnest enough in the pursuit of art, the evening was given up to the discussion of an elaborate program, in which every one present was given an assignment, and such profound subjects as “Drawing to Fill,” “An Original Poem — Short — by request,” “Art in the Police Force,” “Colic as a Motive in Art,” etc., were discussed. The printed program was in itself a most unique production of illustrative art, for, etched in copper on each margin, opposite the names of guests and the toasts they were expected to respond to, was a life-like drawing, caricaturing the person in some characteristic attitude or employment. This was printed upon Japanese vellum, and as each guest wrote his autograph upon a page left blank for that purpose, it will be treasured as a souvenir of the illustrating fraternity of Chicago. Even in the courses of the dinner, the cartoon feature was not omitted, for when the ice cream was served, a statuette of the dog that has long been a feature in Mr. McCutcheon’s cartoons, accurately modeled in ice cream, was placed before that gentleman. The printed 3-panel program for the Second Saturday Evening Saturnalia of Der Professorverein (reproduced below) was probably written, designed and illustrated by Holme. The text is worth quoting in full, as it is representative of Holme’s sense of humor as well as providing some insight into the literary/artistic circles in which he ran. Front of the program for the Second Saturday Evening Saturnalia of Der Professorverein on October 27, 1900 at The Monroe, Chicago. Design and drawings probably by Frank Holme. Image courtesy of the University of Arizona Special Collections Library. 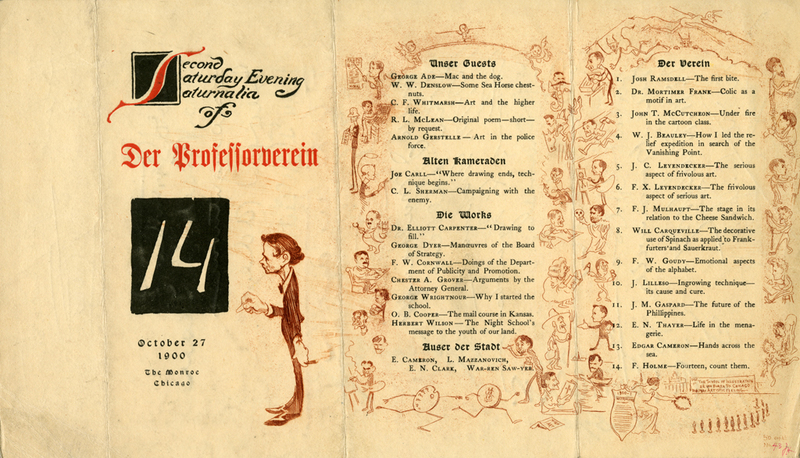 The front panel contains the title, date and location of the event—Second Saturday Evening Saturnalia of Der Professorverein / 14 / October 27, 1900 / The Monroe, Chicago—with a caricature of George Wrightnour chalking in the number of members of the expanded Professorverein. C.F. Whitmarsh—Art and the higher life. Arnold Gerstelle—Art in the police force. George Dyer—Manoeuvres of the Board of Strategy. F.W. Cornwall—Doings of the Department of Publicity and Promotion. Chester A. Grover—Arguments by the Attorney General. George Wrightnour—Why I started the school. Dr. Mortimer Frank—Colic as a motif in art. John T. McCutcheon—Under fire in the cartoon class. J.C. Leyendecker—The serious aspect of frivolous art. F.X. Leyendecker—The frivolous aspect of serious art. F.J. Mulhaupt—The stage in its relation to the Cheese Sandwich. F.W. Goudy—Emotional aspects of the alphabet. J. Lilleso—Ingrowing technique—its cause and cure. In order to better appreciate Holme’s caricatures I have enlarged a portion of the program below. 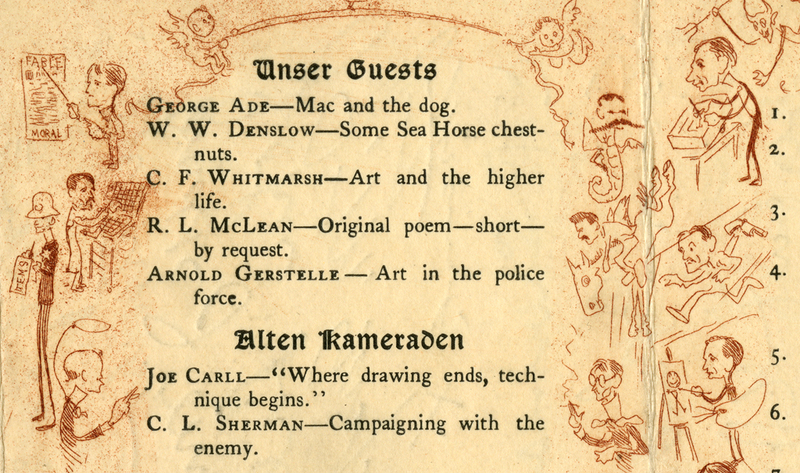 Note especially the visual reference to Ade’s popular Fables in Slang (Chicago: Herbert S. Stone and Company, 1899), the depiction of Denslow as a seahorse, McLean on horseback, Gerstelle with a police helmet, and Whitmarsh setting type. Detail of Der Professorverein program showing several of the caricatures by Frank Holme. At left, from top to bottom: George Ade, C.F. Whitmarsh, Arnold Gerstelle, and Joe Carll; at right, from top to bottom in pairs, W.W. Denslow and Josh Ramsdell, R.L. McLean and John T. McCutcheon, and C.L. Sherman and J.C. Leyendecker. In 1900 only a handful of the individuals present at the Second Saturday Evening Saturnalia were well-known beyond Chicago (i.e., Ade, Denslow, the Leyendecker brothers, and McCutcheon). Here are thumbnail portraits, in alphabetical order, of the twenty-seven participants in the dinner and the four absentees. George Ade (1866–1944)—Ade was one of the most popular humorists of his time, known both for his newspaper stories and his books. The best known of the latter is Fables in Slang (1899), which went through several reprintings and spawned several sequels. W.J. Beauley (1874–1941)—William J. Beauley was a partner in the Chicago architectural firm of Peabody & Beauley before moving to New York around 1905. Joe Carll (1876–1910)—Carll was a cartoonist for newspapers, working in Portland (Oregon), San Francisco, Chicago, and Denver in his career. He was best known for his work for The Daily News of Chicago. Edgar Cameron (1862–1944)—Edgar S. Cameron was a painter. He worked for a window glass factory before attending art school in New York and then studying in Paris. He painted pictures and panoramas for the World’s Columbian Exposition in 1893. Elliott Carpenter (b. 1865)—Carpenter was a prominent Chicago dentist. He may have met Holme in 1898 when his offices were on the same floor of the Athenaeum Building as The School of Illustration. E.N. Clark (1872–1942)—Egbert N. Clark worked as a clerk in the early 1890s before becoming a cartoonist, illustrator, and—later in life—a muralist. He was a student at The School of Illustration before studying at The School of the Art Institute. O.B. Cooper (1879–1940)—Oswald Cooper was a student at The School of Illustration at the time of the dinner at The Monroe. He later ran the school when Holme had to leave Chicago due to tuberculosis. Cooper is best known today as a type designer, specifically as the creator of the eponymous Cooper Black. F.W. Cornwall (1865—1938)—Franklin W. Cornwall was in the printing trade when he was young. By 1899 he was working on Chicago railroad accounts for the advertising agency J. Walter Thompson. He described his profession in the 1900 United States Census as “teacher of advertising”. W.W. Denslow (1856–1915)—William Wallace Denslow is best remembered as the illustrator of The Wonderful Wizard of Oz (1899) and other books by L. Frank Baum. On his own he wrote and illustrated Denslow’s Mother Goose (1901)—with text lettered by F.W. Goudy—and other books. George Dyer (1869–1921)—Dyer was a reporter in Chicago before becoming an advertising manager, first at a department store and later at Hart, Schaffner & Marx. From 1906 until his death he owned several advertising agencies in Chicago and New York. Dyer has been credited with getting J.C. Leyendecker started in advertising. J.M. Gaspard (1861–1919)—Jules Maurice Gaspard was born in France and emigrated to the United States in 1868. He was an artist, first in Davenport, Iowa and then from 1891 on in Chicago where he primarily worked as an illustrator for The Inter Ocean. Arnold Gerstelle (1878–1955)—Gerstell (the more commonly found spelling of his name) was a night police reporter for The Chicago Record. He later became a sales manager for a Pennsylvania coal company. F.W. Goudy (1865–1947)—Frederic W. Goudy’s career as a commercial artist was faltering in the late 1890s. He was working as a bookkeeper when Holme invited him to teach lettering and ornament at The School of Illustration. He subsequently went on to become the best known type designer in the United States. Chester A. Grover (1871–1957)—Grover moonlighted as a police reporter for The Chicago Times in the early 1890s while attending law school at Northwestern University. This is probably how he first met Holme. However, by 1895 he had begun his career as a lawyer. F. Holme (1868–1904)—Frank Holme was a renowned newspaper illustrator from the mid-1880s until 1901 when poor health forced him to leave Chicago for Ashville, North Carolina. He was the founder and director of The School of Illustration. Holme was also the guiding spirit of the Palette & Chisel Club. F.X. Leyendecker (1876–1924)—Like his older brother J.C., Francis X. Leyendecker was an illustrator best known for his magazine covers and advertising work. J.C. Leyendecker (1874–1951)—Joseph C. Leyendecker was an illustrator who gained popular renown for The Arrow Man, a trade character who appeared in advertising for Arrow shirts and collars. He was also a prolific illustrator of magazine covers, credited with over 400 of them in his career. J. Lilleso (b. 1882)—John Lilleso was a newspaper illustrator, most famous for his visual account of the Spanish-American War for the Chicago Daily News. Lawrence Mazzanovich (1871–1959)—Mazzanovich was a landscape painter. In 1899 he left Chicago to work with W.W. Denslow at the Roycroft Press. He gave up commercial illustration in 1903 and moved to Paris. John T. McCutcheon (1870–1949)—McCutcheon was a longtime illustrator and cartoonist for Chicago newspapers, beginning with the Daily News in 1890 but most famously for The Chicago Tribune from 1903 until his death. He is also renowned for his collaborations with his close friend writer George Ade such as “Stories of the Streets and Town” newspaper series. R.L. McLean [sic] (1878–1933)—Robert C. McLean was an architectural critic and editor. For many years he was managing editor of The Inland Architect and News Record and secretary of The Inland Printer. He was also an award-winning amateur photographer. F.J. Mulhaupt (1872–1938)—Frederick J. Mulhaupt was a painter, first in Kansas City before moving to Chicago, and after 1915 in New York and then Gloucester, Massachusetts. He was president of the Palette & Chisel Club in the late 1890s. Josh Ramsdell (1865–1947)—Joshua D. Ramsdell was a photoengraver. He began his career in the trade in 1887 in Buffalo as a partner in Ramsdell Brothers with his brother Ildo. The following year he moved to Atlanta and then onto Erie (Pennsylvania) before arriving in Chicago in the mid-1890s. Ramsdell spent the final 37 years of his life working for photoengraving companies in Rochester, New York. Warren Sawyer (1876–1932)—Edward Warren Sawyer studied at The School of the Art Institute of Chicago. He became a well-known medallist and sculptor. He went to Europe in 1899 and spent the rest of his life abroad. C.L. Sherman (1875–1920)—Clifford L. Sherman was a cartoonist and chilren’s book author. After teaching at The School of Illustration he joined the faculty of The School of the Art Instiute for a few years before moving to the East Coast. E.N. Thayer (b. 1874)—Ernest N. Thayer was a painter and illustrator, but little is known about his career. C.F. Whitmarsh (1858–1920)—Charles Fulton Whitmarsh spent his career in printing and publishing. Most notably he was the secretary and later associate editor of The Inland Printer from 1888 to 1903; and then he was advertising manager/business manager of The Printing Art from 1903 until his death. Herbert Wilson (1873–1941)—Charles H. Wilson was a student at The School of Illustration. He was known as Ham Wilson to his classmate Dwiggins. He went on to have a career as a sketch artist and as a thespian. G.S. Wrightnour (1877–1934)—George S. Wrightnour was the business manager of The School of Illustration. In 1907 he moved to Scranton, Pennsylvania where he was initially a real estate agent before spending the final two decades of his life in the auto supply business. 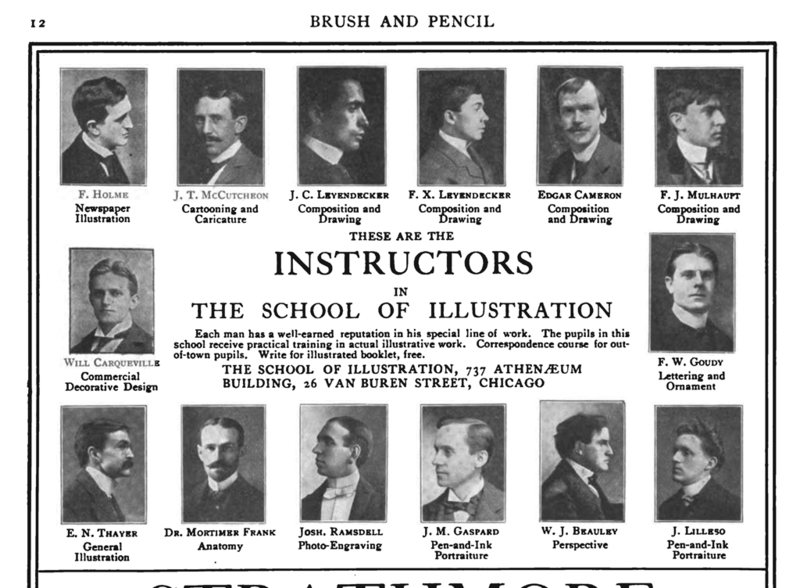 Advertisement for The School of Illustration in Brush and Pencil (December 1900), p. 12 showing the faculty. Note the addition of Dr. Mortimer Frank and Josh Ramsdell. As far as is known, the faculty of The School of Illustration never grew beyond fourteen members. 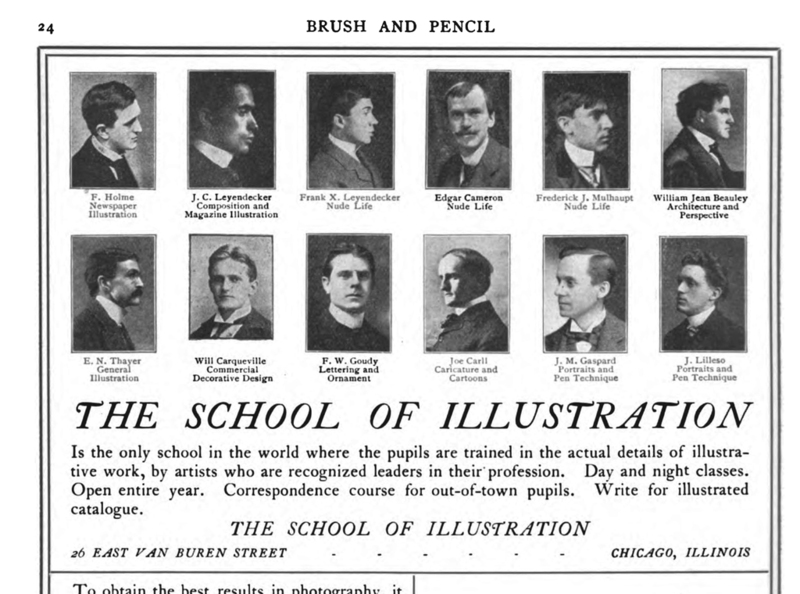 All fourteen appeared in an advertisement for the school in the December 1900 issue of Brush and Pencil and in the booklet Black and White [by Frank Holme] (Chicago: The School of Illustration, 1900). There was never another Saturday Evening Saturnalia. In January 1901 Holme discovered he was suffering from tuberculosis and on February 26 he left Chicago for Asheville, North Carolina in search of a cure. In the next few years he moved to Arizona and then to Denver, but to no avail. Holme died July 27, 1904. Although Holme never returned to Chicago, the school remained in operation for several months after his death. But it was never the same after his departure from Chicago. Dwiggins was fortunate to have attended The School of Illustration during its short heyday between October 1899 and December 1900. There is an intriguing photograph in the John Francis Holme Collection at the University of Arizona labeled “Frank Holme and students”. Given that many of the individuals in it can be identified as either members of the faculty of The School of Illustration or friends of Holme, it is possible that it is linked in some way to the Second Saturday Evening Saturnalia, though not to the dinner itself. Twenty-seven people are listed in the program, fourteen guests and thirteen faculty members (E.S. Cameron was absent), but only twenty-five people are in the photograph. Assuming that one of the attendees took the photograph, that still leaves one person unaccounted for. Below I have attempted to identify everyone. Some individuals are obvious, but others are less clear. Those I am least confident about are indicated by brackets around their names. Possible photograph of participants in the Second Saturday Evening Saturnalia. Image courtesy of the University of Arizona Special Collections Library. Standing back row (nos. 1–7)—1. F.X. Leyendecker, 2. J.C. Leyendecker, 3. W.J. Beauley, 4. R.C. McLean, 5. Will Carqueville, 6. F. W. Goudy [or possibly John Lilleso], 7. Joe Carll. Standing front row (nos. 8–16)—8. E.N. Thayer, 9. G.S. Wrightnour, 10. [Herbert Wilson], 11. [C.L. Sherman], 12. Frank Holme (on hobby horse), 13. John T. McCutcheon, 14. [Chester A. Grover], 15. W.W. Denslow, 16. [Arnold Gerstelle]. Sitting back row (nos. 17–24)—17. Elliott Carpenter, 18. Mortimer Frank, 19. J.M. Gaspard, 20. [John Lilleso], 21. [George Dyer], 22. O.B. Cooper, 23. Josh Ramsdell, 24. F.J. Mulhaupt. 1. The school is commonly referred to as the Frank Holme School of Illustration but that was not its official name. 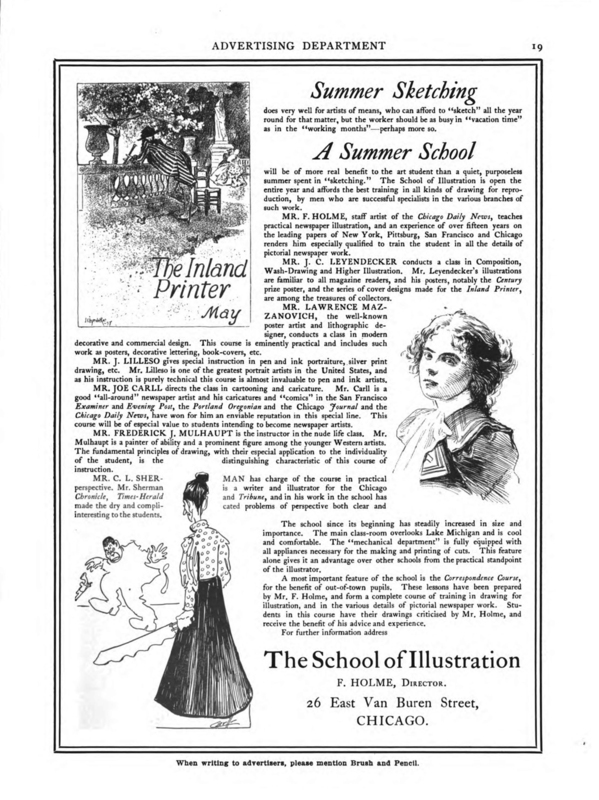 Brochures and advertisements promoting the school referred to it as either The School of Illustration or the School of Illustration. 2. Holme’s penchant for humor and indirect phrasing makes it unclear how many instructors there were at the school during its first four months. In his chronology of the school’s first year, prepared by Holme in November 1899, he says that on October 15, 1898 Joe Carll took the first mail order student “in hand”, but then goes on to say that Carll joined the faculty on July 10, 1899. There are also entries for Egbert Norman Clark and Warren Sawyer (dubbed “Egbert ‘Nails’ Clark” and “War-ren Saw-yer” by Holme) that, at a casual reading could suggest they were early faculty members, joining on November 10, 1898 and December 15, 1898 respectively. But it is more likely that he was simply singly them out as prominent or favorite students from the early days of the school. Clark is listed as a clerk in the 1897 Chicago city directory. Holme’s comment that Sawyer “flies the Academic coop” is a gleeful reference to the student leaving a rival school, the large School of the Art Institute of Chicago. Furthermore, the inclusion of work by both Clark and Sawyer in “A School with a Purpose” by E.S.C. [Edgar S. Cameron] in Brush and Pencil (November 1, 1899), pp. 86–87 reinforces the identification of them as Holme students. However, a 1951 profile of Clark says that he studied and taught at the School of the Art Institute of Chicago, and that as a close friend of Holme he “assisted” him at his school. See “Bert Clark: Illustrator: by Ellis K. Baldwin in North Country Life vol. 5, no. 3 (Summer 1951), pp. 9–14.For Holme’s full chronology, which runs from September 21, 1898 to November 11, 1899, see The Inland Printer vol. 24, no. 3 (December 1899), p. 439. Egbert N. Clark (1872–1942) went on to have a career initially as a magazine illustrator and cartoonist and later as a painter and muralist. Edward Warren Sawyer (1876–1932) continued his art studies in Europe and became a noted medalist and sculptor. 3. Holme’s chronology lists Leyendecker, Muhlhaupt, and Carll as being added to the staff on July 10, 1899, but in an article in the June 4, 1899 issue of The Chicago Tribune on the meteoric rise of The School of Illustration all three of them are already described as members of the faculty. See The Chicago Tribune (4 June 1899), p. 42. 4. These changes are based on Holme’s chronology which says Cameron was added Agust 1, 1899 and that Mazzanovich and Sherman left September 10, 1899. See The Inland Printer vol. 24, no. 3 (December 1899), p. 439. However, advertisements for the school in Brush and Pencil for both September and October 1899 include Mazzanovich and Sherman, but not Cameron. See Brush and Pencil vol. 4, no. 6 (September 1899), p. 2 and vol. 5, no. 1 (October 1899), p. 16. Further confusing matters, The Chicago Tribune issue of August 20, 1899 reported that Mazzanovich had already been teaching at the Roycroft School of Applied Art, but had returned to Chicago to run The School of Illustration while Holme was on vacation. He was planning to return to East Aurora on September 1. Cameron does not appear in an advertisement for the school until November. See Brush and Pencil vol. 5, no. 2 (November 1899), p. 18. It is uclear what role Sherman had at The School of the Art Institute of Chicago. Holme implies he was on the staff, but Alex Jay in his online profile of Sherman says he was a student. I have been unable to document Sherman’s time at the school, but I doubt he was a student. He is not listed in the catalogue of students for the academic year 1901–1902 that is incorporated into The Art Institute of Chicago School of Drawing, Painting, Sculpture, Designing, Architecture Circular of Instruction for 1902–1903, with Catalogue of Students (Chicago: The Art Institute of Chicago, 1902). 6. The Union Restaurant, owned by Herman Weber, underwent extensive remodeling throughout 1898 as the building it was located in—owned by the Pabst Brewing Company—was transformed into the Union Hotel. See articles and advertisements in The Inter Ocean [Chicago] for 2 January 1898, 21 June 1898, 16 October 1898, and 24 December 1898. It was described as a “German restaurant,” but served steaks, oysters, and the usual rich fare of the time. 7. “Dinner to Der Professorverein” in The Inland Printer vol. 24, no. 3 (December 1899), p. 439. 8. Exactly how Dwiggins came to enroll at Frank Holme’s School of Illustration is not entirely clear. There are several accounts which I will discuss in a future post on Dwiggins and the school. E.g. see W.A. Dwiggins: A Life in Design by Bruce Kennett (San Francisco: Letterform Archive, 2018), p. 19. There are no accounts of the number of students at The School of Illustration—the only indicators of its growth being the size of the faculty, the number of courses that were offered, the number of rooms it occupied, and the facilities it had—but it is unlikely that there were ever more than 200, including mail-order students, at one time and the number was probably half that. In comparison, The School of the Art Institute of Chicago had an enrollment of 740 day students and 400 evening students in the 1899/1900 academic year. See Over a Century: A History of The School of the Art Institute of Chicago 1866–1981 ed. Roger Gilmore (Chicago: The School of the Art Institute of Chicago, 1982), p. 128. In 1901 there were 32 instructors and lecturers along with 34 teaching assistants drawn from the ranks of the “advanced students”. The number of day students was 797 with 718 more in the evening program. See The Art Institute of Chicago School of Drawing, Painting, Sculpture, Designing, Architecture Circular of Instruction for 1902–1903, with Catalogue of Students (Chicago: The Art Institute of Chicago, 1902), pp. 9–11. 9. Dr. Frank appears for the first time in an advertisement for the school on Brush and Pencil vol. 5, no. 6 (March 1900), p. 12. Exactly when Ramsdell joined the school as an instructor is unclear. He gave a series of talks on photo-engraving at the school in the spring of 1900, but is not listed on an August 1900 copy of the school’s letterhead. He was present at the second dinner of the Professorverein in October 1900 and included in an advertisement for the school in Brush and Pencil vol. 6, no. 3 (December 1900), p. 12. See Brush and Pencil vol. 6, no. 1 (April 1900), p. 17 for the reference to Ramsdell’s lectures. For the letterhead see Frank Holme to Eva Dean 18 August 1900 in The Huntington Library, Edwin Hill Bliss Collection, Box 5, Folder 17. 11. The Inland Printer vol. XXVI, no. 3 (December 1900), p. 494. The article was supplemented by illustrations by several members of the Professorverein on pp. 494–495: Holme, Beauley, F.X. Leyendecker, Cameron, Lilleso, Thayer, Mulhaupt, Carqueville, Gaspard, and McCutcheon. A very short notice of the dinner—which omitted any mention of Holme—appeared in The Chicago Tribune 28 October 1900, p. 4. 12. The style of lettering and caricatures match those of The Song of the Twisted: Being a Tale of Woe, an unpublished manuscript by Holme. See The Library of Congress Rare Books and Special Collections Division, Frederic W. Goudy Papers, Box 19, Folder 8. This copy of the program was deposited at the University of Arizona Special Collections Library (John Francis Holme Collection, MS1, Box 1, Folder 6) by illustrator Cyrus LeRoy Baldridge (1889–1977), famous as the youngest student to ever attend The School of Illustration and a favorite of Holme. Although “Roy” appears in pencil on the back above the signatures of those at the dinner, I seriously doubt he was present since his name is not on the program nor is it mentioned in the description of the evening by The Inland Printer. Furthermore, it is not among the signatures on the facsimile of Oswald Cooper’s copy of the program tipped into The Book of Oz Cooper: An Appreciation of Oswald Bruce Cooper, with Characteristic Examples of His Art in Lettering, Type Designing & Such of His Writings as Reveal the Cooperian Typographic Gospel (Chicago: Society of Typographic Arts, 1949) opposite p. 40. Baldridge is also missing from Holme’s copy of the program which is in the Arizona Historical Society, John Francis Holmes Papers MS0361, Box 2, Folder 23. 13. The text is from the front of the program for the Second Saturday Evening Saturnalia of Der Professorverein (27 October 1900). Design and drawings probably by Frank Holme. Image courtesy of the University of Arizona Special Collections Library. The annotations in brackets are mine. Note that W.W. Denslow was not part of the faculty of The School of Illustration, contrary to the claim in W.A. Dwiggins: A Life in Design by Bruce Kennett (San Francisco: Letterform Archive, 2018), p. 20. 14. In censuses and city directories, between 1889 and 1930, Carqueville described his profession variously as artist, commercial artist, designer, and lithographer. 15. Frank was secretary of the Chicago Society of the History of Medicine. “His major contribution to the history of medicine relates to the history of anatomical illustration. The classic book on that subject had been published in 1852 in German by the physician and historian, Johann Ludwig Choulant (1791-1861). However, by Frank’s time this text was both out dated and out of print. Frank took on the tremendous project of translating Choulant’s German text into English as History and Bibliography of Anatomic Illustration in Its Relation to Anatomic Science and The Graphic Arts.” From “Mortimer Frank, Johann Ludwig Choulant, and the History of Anatomical Illustration” in the Journal of Medical Biography (2018). 16. There is little detailed information on the life of The School of Illustration between 1901 and 1904. When Holme moved to Asheville, Oswald Cooper took over running the art side of the school while Holme’s wife Ida handled the business side. See the surviving correspondence between Holme and Cooper at The Huntington Library, Edwin Bliss Hill Collection, Box 5, Folders 12–16; and Goudy to Cooper 1 August 1904, Box 4, Folder 21. In the latter Goudy says that he assumes Holme’s death means that the school will close. However, Holme’s obituary in The Arizona Republican [Phoenix] 28 July 1904, p. 5 says that the school will be carried on by his widow. That was followed several weeks later by this item: “HOLME’S SCHOOL LIVES—Mrs. Frank Holme, wife of the late artist, whose memory to many Phoenicians will be long hallowed, has written a letter to Tom Reed, the well known actor and hotel man who managed all of the famous Holme’s chalk talks. Mrs. Holme continues in the management of the Chicago school of illustration which her husband founded before he came to Phoenix. She has refused a good offer for the institution.” The Arizona Republican [Phoenix] 16 August 1904, p. 5. And as late as December 1904, Cooper was described as the superintendent of the school. See The Coffeyville [Kansas] Daily Journal 26 December 1904 p. 1. 17. University of Arizona, John Francis Holme Collection (MS1), Box 1, Folder 5. 18. Where was the photograph taken? The wall plastered with pages from the The Illustrated Bulletin indicates that the location is not a dining room at The Monroe. For a photograph of a dining room at The Monroe in October 1900 see “The Inland Printer Dinner” in The Inland Printer vol. XXVI, no. 2 (November 1900), p. 330. 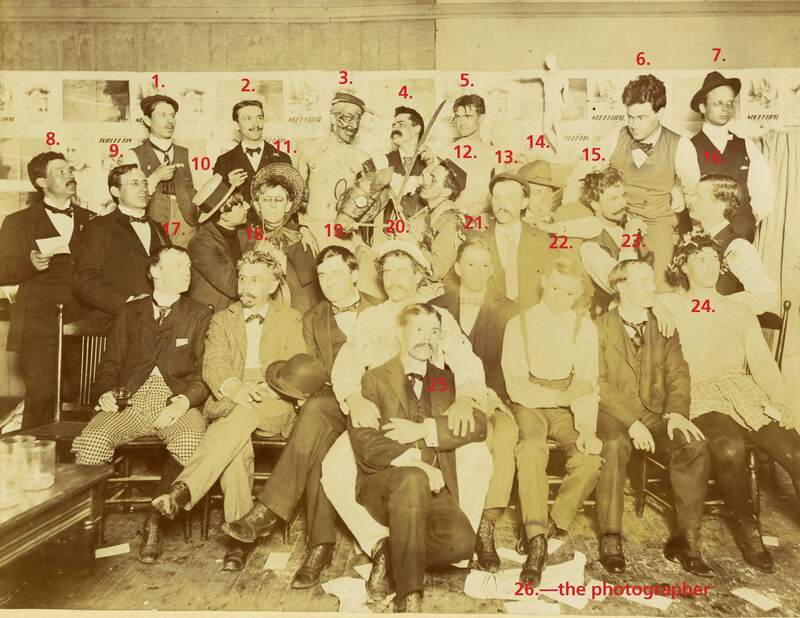 Perhaps the photograph was taken in one of The School of Illustration classrooms in the Athenaeum Building. Note the plaster statue in the background. Since only a few of the people in the photograph were members of the Palette & Chisel Club, I doubt it was taken on their premises. I have been unable to learn anything about The Illustrated Bulletin as only one issue (volume 1, number 1—May 7, 1898) is known to exist. However, that issue—devoted to the Spanish-American War—is the same one that is in the photograph. See the Arizona Historical Society, John Francis Holme Collection MS0361, Box 1, Folder 4. Kate Stewart, archivist and librarian of the Society, tells me that Holme is listed as the art director of The Illustrated Bulletin and that its offices were at the Atheneum Building, 26 Van Buren Street—coincidentally the home of The School of Illustration several months later. See email Kate Stewart to Paul Shaw 3 April 2019. 19. My identifications are based both on photographs of each individual, but also on the caricatures by Holme and Carll. I have been unable to find photographs of Chester A. Grover and Arnold Gerstelle. There are numerous photographs of Ade, but no one in the photograph has his distinctive aquiline nose. It is possible he was not present when the photograph was taken.